The fourth-generation Chevrolet Malibu was quite a bit different than the front-wheel drive family sedan that wears the Malibu badge today. With rear-wheel drive and an available four-speed manual transmission and 5.7-liter V8, the Malibu of the late 1970s and early 1980s was decently sporty. It also served as Chevy’s NASCAR entry at the time, evidence of the automaker’s sporting aspirations for the mid-size family car. General Motors never built an actual fourth-generation Malibu SS, but a Craigslist seller recently listed his own take on a fourth-gen Malibu SS and we think the results are nearly perfect. 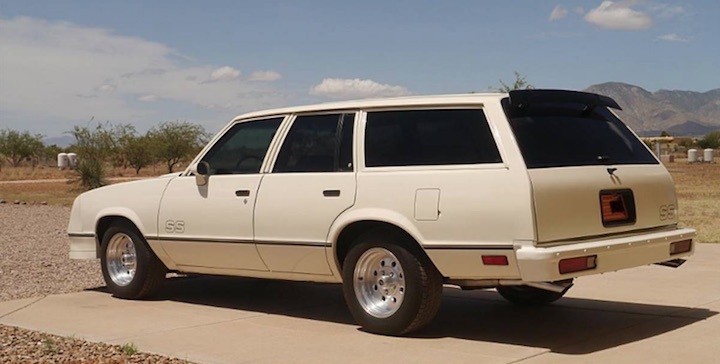 Instead of starting with a coupe or even a sedan body, the builder of this car decided to opt for the less common and less loved Malibu wagon. He then dropped in a Small Block Chevrolet V8 of some sort (the listing doesn’t say, but it could be a 350) and paired it with a four-speed manual transmission. This well-executed Malibu SS wagon build also gets Bilstein shocks out front and the owner claims it’s a daily driver, so it seems to be of sound quality. Another interesting aspect of this build is the Monte Carlo SS front end. While there was no Malibu SS of this era, there was a Monte Carlo SS at the time, so this fascia swap makes perfect sense. It does look a bit odd of you’re familiar with either of these cars, though. At least it gets a good nickname – the owner of this car calls it the ‘Montibu’. While we do love the idea of a Malibu SS wagon, this one isn’t cheap. The owner asking nearly $14,000 for it, but haggling is expected on Craigslist, so it may sell for less. Do you think this DIY Malibu SS Wagon is worth its asking price? Check out the listing here for more photos and let us know what you think in the comment section below. Next story Poll: Should GM Trucks Offer A Ram MegaCab Rival? Didn’t Monte Carlo SS only arrive in 1984? Were rwd Malibus still being made then? Think Malibus ended after1983? Monte Carlo and El Caminos stayed till 1987. Last of the good old rwd line. That is more like a 1986 Monte Carlo front end. They were 5 years ahead of their time. The fourth GEN Malibu had a 305 V-8. You could get a 350 only with the 9C1 option. This is a fairly neat example of someone knowing the GM parts bins fairly well and knowing what could be mixed and matched to create a vehicle GM wouldn’t. Looks good from every angle except a direct side-shot, then the prominent schnoz seems to overwhelm the rest of the body. Could somebody enjoy the living daylights out of this? Absolutely? Would they enjoy it as much from $14k? Probably not so much. Thought of putting a Regal front end on my 78 ElCamino, painting it monochrome black and calling it El Grande National. Yes you’re correct and that is a 1979 Malibu with the front facia from a 1984 or newer Monte Carlo SS. I love this car.. I bought my daughter an 81 Malibu Stationwagon. The longest car on earth she called it.. She passed her drivers licenses test in it. Three point turn and parallel parking too..
Wayne Barratt is correct, IIRC the Monte Carlo SS front end is just a bit wider than the Malibu/El Camino and doesn’t fit. I recall the Monte Carlo fenders being just a bit wider than the Malibu/El Camino, so you can’t just put a Monte Carlo SS front fascia onto a Malibu/El Camino, which is why Choo Choo Customs had to make their Monte Carlo SS front fascia copy for their custom El Camino SS. Yes, I was there in the 70s/80s!